Recently I have been hooking crochet borders for a program that I taught earlier this month at my local knitting guild: Houston Knit at Night for the Chicks with Stix chapter. There were 20 odd ladies - the largest number I have taught in one go but as I reminded myself they were all learning the same thing. My regular weekly workshop involves helping up to 12 students with their own specific requirement on the individual crochet (or knitting!) project that they are working on. And I also teach one-to-one lessons. My favorite was probably the book by Edie Eckman. I like the way she provides border design charts as both horizontal borders as well as actually going around the corner. Edie doesn't leave you guessing what to do. Kristin Omdahl has a very modern take on borders and edges in her book and unlike the other two has project patterns which include the featured edgings. One of these is the incredible Memphis Bag which I am just going to have to make. It's gorgeous! 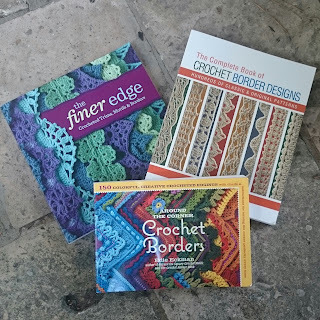 Linda Schapper's book contains the largest number of borders of the three and I love how Linda categorizes her borders into different types. If I wanted a shell border I could look through dozens of patterns to find the one I like best. 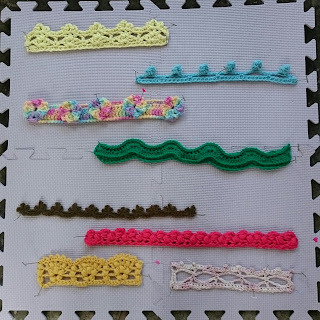 For my samples I picked out single color borders from my new books, trying to show a range of different types of stitches (picot, shell, post stitch, bobble etc.). 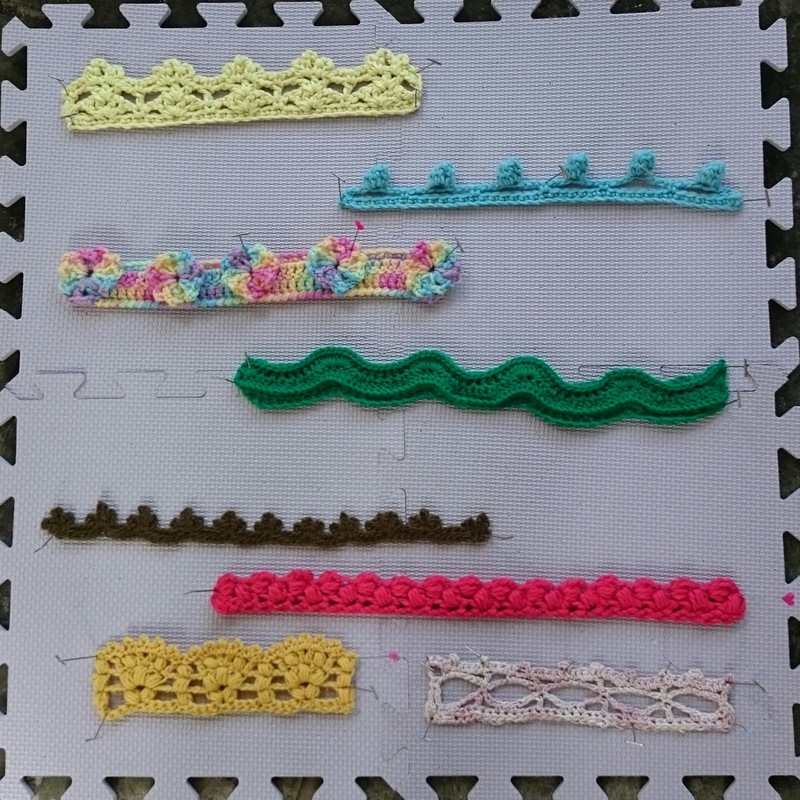 I also prepared square samples of simple border stitches on knitted squares: single crochet, picot, shell and crab stitch. I gave the ladies prep work too: to bring a knitted square to add a crochet border to. I was impressed that almost everyone had actually done their homework and arrived with their squares ready to learn. By the end of session I was admiring many pretty shell borders. Marvellous! I'm glad you found this useful Jodie!! I do so enjoy adding to my crochet book collection. Good luck finding the right border and I look forward to hearing about it.